His face may show signs of age but Sting still knows how to own a crowd. The capacity Riverstage audience hung on his every note on Monday night as he took them through his songbook. There may have been 60 or so people on stage but only one man mattered. 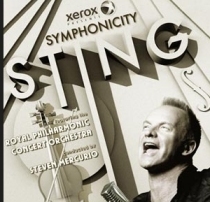 Sting provided a rollicking journey through his career, expertly backed by the Sydney Symphony Orchestra. From 'Every Breath' to 'Fields of Gold' to the pulsating 'Roxanne', no one (except the man himself) ever imagined the gentle guitar of 'Whenever I Say Your Name' would be carried by a full string section, but last night Brisbane saw that realised. Sydney Symphony rose to the challenge of recreating the music of Sting and The Police with a wonderful symphonic sound giving songs like 'When We Dance' and 'Russians' a new level to enjoy under the baton of US conductor Steven Mercurio who extracted every ounce of beauty from his orchestra. At 59, Sting can be called an ageing rocker but age certainly has not wearied him as he worked the stage like a pro, belting out his hits. With scores of emergency services workers in the crowd, Sting signalled the close of his Brisbane show with 'Fragile', a tribute to those affected by last month's floods. It was a touching moment in a spectacular journey through more than three decades of beautiful music. In recognition of the selfless volunteers who generously helped their fellow Queenslanders in a time of tragedy, Sting and Live Nation have elected to invite many of these volunteers to his forthcoming Symphonicity concert at the Brisbane Riverstage on Monday, February 7. At the suggestion of the Queensland Premier's office, recipients will be selected by ballot from the Red Cross, the State Emergency Service and Volunteering Queensland.